I wrote this almost three weeks ago, over a weekend, and meant to take it to the first therapy session of the week with me and show it to my therapist. It was during the very early days of our ‘new approach’ of trying to restrict (or cut out) email contact outside of sessions. And so in that spirit, I wanted to show her the poem in person, rather than send it electronically. However, my mood and attitude in session were different to how I had been feeling when I wrote the poem, even though there was no obvious reason behind the change. The change wasn’t even apparent until I was in the room – perhaps something that happened very close to the start of the session (and which I now can’t remember), triggered my defenses, or perhaps it was something else entirely. By the end of the week, things had recovered, but there was a similar replay the following week; and by the time I hit a short therapy break (which I’m nearing the end of), I still hadn’t managed to show her the poem. I now suspect I simply won’t get the chance as there will be too much else to cover before we then hit a longer, four-week break. The break itself has followed a similar pattern to those previous two weeks – a few ‘good days’ where I feel connected, vulnerable, open, and determined, followed by a fairly sudden change where it’s almost as if a switch is flipped. I then suddenly see everything through a lens of fear, self-hatred, and potential judgment, which closes me off and puts up my defenses. Whichever lens I’m looking through, it colours everything from my perceptions, to my thoughts, to my feelings, to my behaviour. It feels as though my worldview shifts into a different state, and that the changes in thoughts and feelings are symptoms, rather than causes of that shift. Which still leaves me searching for an explanation as to why this happens, and that in turn leaves me feeling incredibly frustrated and demoralised. It feels as though I have little control over these shifts; they are regular, and unpredictable, and I feel completely at their mercy. That is difficult at the best of times; but during a therapy break, when I need to try and maintain my equilibrium, it is even more problematic. Thinking back, I think these shifts have always been there, but they are more noticeable in the context of no contact outside of sessions, where I cannot seek reassurance and try to reconnect ‘in absentia’. It also means that whatever is going on, the changes are much more clearly something to do with me and my own thoughts, as they are not happening in connection with anything my therapist might have said or not said, over email (or even my expectations of what she might have said, or not said). That is both a consolation (as it means I still feel secure in who she is) and a concern (as I have no easily identifiable trigger or explanation for what is going on). As I was writing this poem, some of the language evoked images and memories of self-harm. Though initially it was unconsciously done, as I worked on the poem it became more intentional. Some of the images felt a little incongruous with the subject matter, which is essentially a positive statement about my determination, despite these mood/worldview shifts that I appear to be caught up in, to be open to everything my therapist has to give me, including the tough lessons that preparing to lose her, and then losing her (at the end of therapy), will bring. However, something about the images also felt right; if they are a little radical or a little unsettling, well, so is complete openness and vulnerability – at least for someone who is used to the very opposite of those things. They are unsettling because to someone who is not used to them, exercising them can feel like leaving one-self wide open to hurt and harm. And so it seemed fitting that the poem should somehow be a kind of re-interpretation of self-harm; that its words should give a different meaning to the images that they invoked. Thoughts and images of self-harm have resurfaced more frequently since my therapist and I have virtually stopped email contact. However, I’m hoping that now, when that happens, the words of this poem will come to mind. And that instead of feeling desperate and afraid, I will remember that openness may hurt, but – just as oxygen binds to blood and keeps my body alive, the internal bond with my therapist and the love that I carry for her, sustains me. If she’s reading, I want her to know that I know that – even when that knowledge is a little buried or veiled from view, and even when that knowledge is difficult to feel. Categories: Poems, quotes and music, Therapy | Tags: a reintepretation of self-harm, borderline personality disorder, BPD, bpd and mood changes, bpd and worldview, poetry, self-harm, therapeutic relationship, therapy, therapy and vulnerability, therapy break | Permalink. I think any changes to the boundaries in therapy are unsettling – even threatening – no matter how far you have come and how stable you are, and that can make you much more reactive even if you don’t recognise at the moment exactly what the triggers are. Not using email is a change, but bringing things into therapy in a different way (such as bringing a physical copy of the poem in instead of emailing it) is also a change. It sounds like this is uncovering a whole new layer in your relationship with your therapist, which you’re acknowledging as painful now but ultimately helpful. Heya….understanding you and feeling your frustration. I too have recently stopped emailing my therapist in between sessions due to new boundaries. Very challenging. My mode flipping is quick, distressing and unhelpgul and I’m not sure I’ll every understand myself. I think I AM flawed… My therapist emailed me recently stating she doesn’t love me after emailing her often that I loved her… How mortified I felt! Of course I know she doesn’t and can’t love me….. I’m not stupid! Anyway, it hurt. I also feel self harm is beautiful. Wrong, crazy but beautiful. One day I’ll fly away….. I am so sorry for what you are going through 😦 the situation sounds very difficult, particularly taking on board your therapist’s response. Have you talked to her about how her response has affected you? I don’t know the context and what else was said, so it’s hard for me to comment, and I think valuing the integrity of a therapeutic relationship is crucial and passing comment has to be extremely carefully done – no one but the two of you, at the end of the day, truly knows what goes on in that space. But I can see what a very difficult and hurtful thing it must have been to hear – and if you can bear to talk about it, it might be helpful. Whatever her comment may mean, it does not mean that you are unlovable – and I’m sure she would want to know if that is how you felt as a result, and she would want to help you to see that it is not true. As for self-harm and beauty….I guess I was intending the poem to portray the beauty of vulnerability, which hurts, rather than commenting on self-harm itself. I think it’s important to try and shift the stigma associated with self-harm so that it’s _not_ seen as wrong and crazy, but at the same time I think it’s important to be clear that there are healthier and more longer-term useful coping strategies, and that self-harm, like many coping strategies, can have addictive qualities which it can be hard to break from. The pain that leads someone to self-harm is heartbreaking, and I think that’s all too-often missed in all the other feelings/judgments/perceptions that many people have about it. Please take care, and be kind to yourself…..
“It also means that whatever is going on, the changes are much more clearly something to do with me and my own thoughts, as they are not happening in connection with anything my therapist might have said or not said, over email (or even my expectations of what she might have said, or not said).” This is a major therapeutic step. The vulnerability you show is also a major step, though we do have to learn how to manage our shields: no one can live unguarded at all times, even as being perpetually closed offers no “life.” The poem is very powerful. I’m reminded of a comment about politicians, to the effect that candidates campaign in poetry, but govern in prose. Perhaps it applies to the life of the rest of us, as well, where governing becomes more about living a daily life than our private, personal, intimate moments of poetic fancy. Thank you 🙂 My therapist also said it was an important step – I was tempted to ask if she had read your comment 🙂 I’m really glad you liked the poem – it took me a very very very long time to have the courage to publish poems as it feels like an art-form that is much harder to execute well, than some other types of writing, and it also feels somehow even more revealing than intimate prose. In that sense, my comment tallies with your own last sentence, however, I’m interested by your use of the word ‘fancy’ and also the idea of campaigning in poetry – there is an implication in your last sentence of something both intimate but also not quite real or true, and I was wondering if you could elaborate on that? I never really kept much of a diary, but the poems of my teenage years are a very accurate emotional barometer and indicator of how I was feeling – there were certainly some moments of ‘fancy’ (and swooning over dead poets! ), but also much much intimate truth….. The phrase about politics, I believe, is intended to say that politicians try to inspire, voice lofty thoughts, express aspirations. Governing, on the other hand, is not so poetic. It has more to do with grinding things out, twisting arms, persuading, and negotiating. By using that reference, I meant to contrast the sets of circumstances that exist in the therapist’s office and in real life outside. In the therapist’s office one can be completely open. Outside, not matter the best possible therapeutic outcome, one has to be practical and, often, careful. My use of the expression “poetic fancy,” might not have been the best way to convey what I’ve just written. It was I who was at fault for not being clear enough, not you. 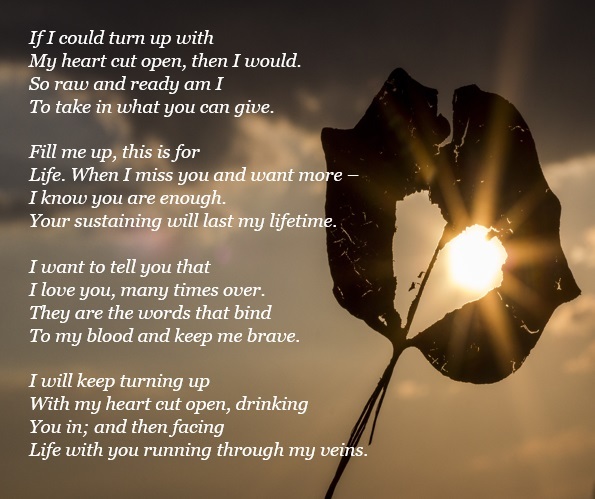 The longing for someone to pour our entire selves into perhaps needs to be fully acknowledged before it can be given up as not really possible due to a therapy situation in which time is so limited. Its a kind of frustration. I try to pour my longing into a higher place in my own consciousness so that my self feels held by something and I don’t perpetually seek desperately out there all the time. But that doesn’t negate a need to let down defences and let our longings be known. Thank you for a really interesting comment…….I’ve been thinking about your first and last sentences, and feeling that they are talking about slightly different things. In the sense that letting our longings be known can be different, perhaps, to wanting to pour our entire selves into someone? I say that as someone who used to believe passionately that the ‘ideal’ state of love, involved ‘merger’, and more specifically flowing _into_ someone else (rather than the other way around). Therapy has helped me see the value and importance of separateness, but I don’t think that’s incompatible with letting down defences and making our longings known. Where is gets tricky, and more like merger (speaking very personally, here! ), is when I have a desire to make _all_ my longings known i.e. feeling as though I must be fully known, instead of being comfortable with accepting that love and care and understanding and knowing another person, can exist in the absence of knowing everything, and that it’s okay – more than okay – to not know some things, and it doesn’t ‘lessen’ the relationship. I still struggle with that, even though I don’t think I struggle with ‘merger’ anymore….does that make sense? I’m really glad you’re able to place those longings within yourself, and that it helps….Thank you again for reading and commenting!